WHAT IS THIS ON MY HAND? It is impossible for them to fly, but in The Exumas, they can swim! Just north of Staniel Cay on an island of their own called Big Major’s Cay, live a drove of pigs. Initially, residents relocated these animals to Big Major’s Cay in anticipation of a major down-turn in the economy during the Gulf War. 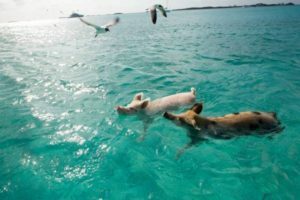 When unsuspecting visitors stopped by to snorkel or swim at Big Major’s Cay, they were greeted by a welcoming drove of pigs. As they fed these harmless, sociable creatures, it became a habit for them to come out of the coppice at the sound of a motor with the anticipation of getting some food. We have flying pigs in cinicinnati so swimming seems much more logical.